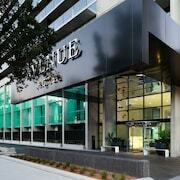 Great location close to restaurants and cafes. Beds and pillows need replacing. Would stay again. Great gym and location The location is very close to the centre and shops, the food is very nice although a little pricy and the gym is not what you would expect from a hotel; it’s guite big with a large range of equipment. 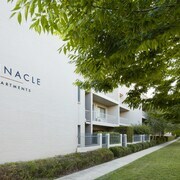 These apartments are located throughout the area in Griffith. 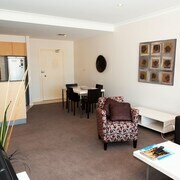 serviced apartment Kingston was a good small unit with everything to be comfortable and close to Kingston shops. Of note was the flimsy curtains in the living space which meant we had to sleep with a heater going all night and have the temperature cranked up as there was no residual heat. 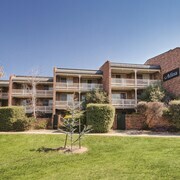 These apartments are located throughout the area in Braddon. Awesome location. Very nice apartment with everything you need. Only issue I really had was that the bedroom up the top of the loft apartment got a little warm. But it wasn't a big deal. It’s that time of year again. You’re spending at least three hours a day fantasizing about your next holiday, and you’re fully checked out at work. 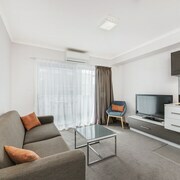 Every day, you’re absently ticking tasks off your list as you imagine yourself draped on a chaise lounge in a posh serviced apartment, prepping for an adventure in Canberra. 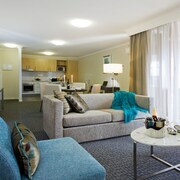 Imagine mornings spent sleeping in as long as you want, and afternoons and evenings spent out and about in Canberra. You’re ready for a break—and do we really need to trot out all the research about how travel makes you happier, saner, and (fine, this part’s for your boss) more productive? Sure, your bank account is urging you to do the responsible thing and stay home. After all, from the fancy flats to the boozy bevvys, you’re bound to emerge flat broke, right? Wrong! 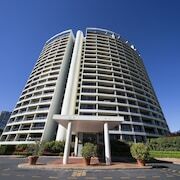 You can find all sorts of cheap short-stay apartments in Canberra so you’ll have plenty of leftover cash. Exciting days are waiting in Canberra. Snag one of our ridiculously good-looking deals today and get a move on!